I watched Role Models the second time yesterday and from the look of my old notes, I enjoyed it more the second time. Wheeler (Seann William Scott) and Danny (Paul Rudd) work for the energy drink company Minotaur. 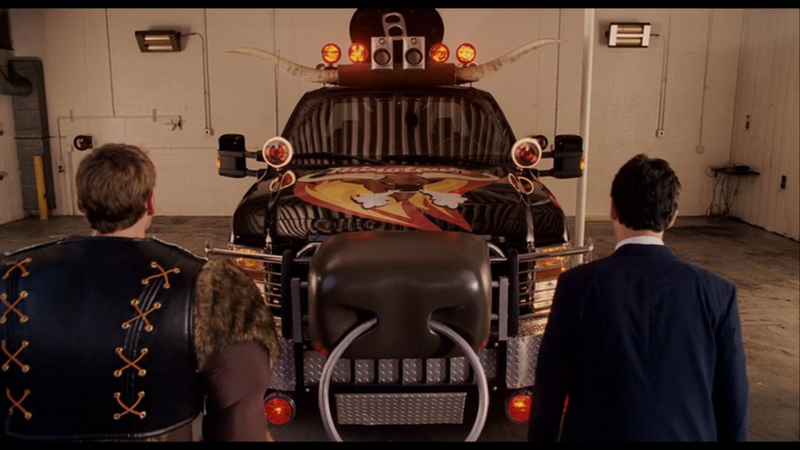 As a brief overview, Danny (Paul Rudd) and Wheeler (Seann William Scott) work for an energy drink company and drive from school to school giving "Drugs Are Bad" talks while promoting Minotaur energy drinks in their place. Omitting spoilers, there's a bad chain of events which cause the two to choose between doing thirty days in jail or community service. They pick the later and are sent to an organization called Sturdy Wings where they are assigned a little. Wheeler is given a trouble-maker named Ronnie and Danny is given a live-action role playing fanatic named Augie; they both have trouble connecting with their littles and the movie continues from there. Of course, missing from the description is a list of all the dirty jokes, sexual innuendos, and so on. For example, in one scene, Ronnie is indiscreetly staring at a woman's breasts. Wheeler tells Ronnie, "Never stare at the boobies, kid" and then shows Ronnie how he himself is "aware without drawing attention." The camera pans to each example as Wheeler speaks: a women with "34-C's" setting up a tent, a hiker on the ridge, and the ridge itself. Dirty, but hilarious.